Philip Colbert is a London-based artist who encapsulates the spirit of Pop-Art in his humorous, colourful, and flamboyant creations inspired by mass culture and visual media. 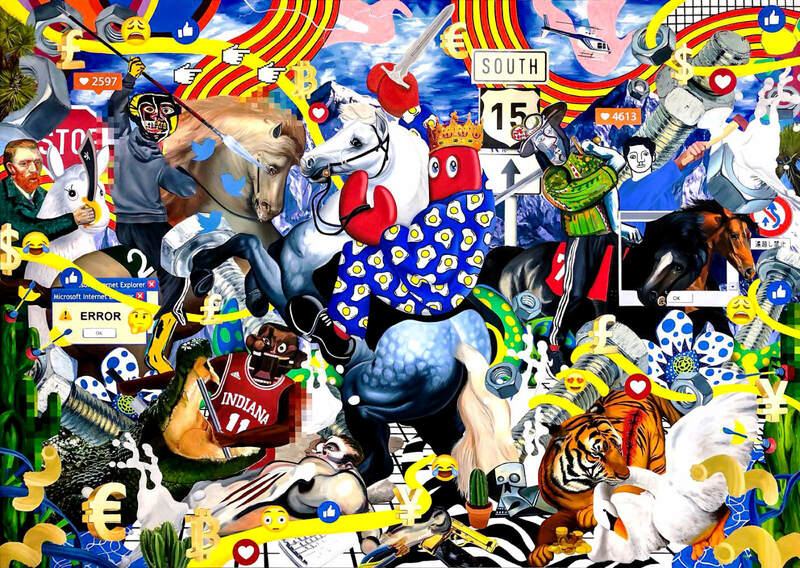 Colbert works in a wildly exuberant aesthetic that updates the legacy of collage for the internet age. His works are saturated with the detritus of everyday icons, symbols, and objects and are sometimes narrated by the distinctive personality of his comical lobster alter ego. Colbert’s oil paintings challenge and toy with the viewer’s cultural vocabulary - superimposing commonplace banal objects onto painted faces and merging portraiture with popular culture in a Magritte-like fashion. Full observation of Colbert’s paintings cannot be done with a quick scan, because every nook and crevice is crammed with so much whimsical detail that the eye cannot help but linger, he states, “My work is a reflection of the hyper saturation of our culture – iconic images from art history alongside iconic brand images which reflect our crazy ferocious appetite for image consumption.” Emojis, computer windows, classical architecture, Lichtenstein spots, comic book sound effects, cactus plants, pixelated mouse cursors — all manner of things have a place in Colbert’s artwork. In a way, Colbert embodies what a 21st-century Renaissance man could look like: he is an artist, as well as a fashion designer, he founded the label ‘The Rodnik Band’, and also customises and designs furniture, even shrink-wrapping a BMW 7 series with a fried egg design. However, he is perhaps most content with the label he has given himself — ‘Neo Pop Surrealist’ — a title which encapsulates the hybrid nature of his work and his distinctive persona, synthesising past and present, in order to pave the way for the future. Most recently, Colbert participated in Unit London’s Summer Group Show entitled Looking For U, exploring the relationship between fine art and digital communication, examining how our exposure and obsession with mass media has affected our consumption of imagery. The exhibition featured Colbert’s paintings, as well as two sculptural works by the artist based around his lobster motif — a cheese grater and a neon light piece. His works have featured in major institutions around the world, including at Saatchi Gallery, Tate Modern, and the Van Gogh Museum, as well as in art fairs such as Art Miami and Art16.